Since 1928, Grand Terminus has offered luxury Norwegian accommodations in the heart of Bergen, the beautiful town that inspired Arendelle, the setting of Disney's Frozen. 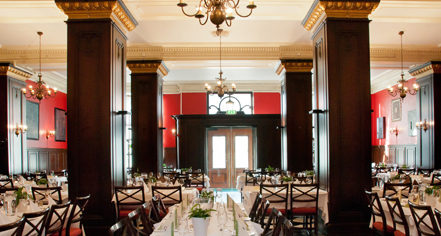 With 131 charming guestrooms and several banquet rooms, Grand Terminus is a popular venue for weddings and events. Originally built by renowned architects Fredrik Arnesen and Arthur Darre Kårbø, the property’s design was awarded with the prestigious architectural Hauen Fonds Diploma. Today, the hotel and its guestrooms have been thoughtfully and carefully renovated and feature much of the original structure with refurbished furniture to complement the classic design. Grand Terminus, a charter member of Historic Hotels Worldwide since 2011, dates back to 1928. The Grand Terminus' façade was granted protected heritage status in 2012. Parking: On-site parking: Not Available. 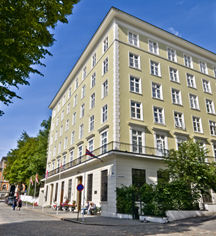 Since 1928, Grand Terminus has offered luxury Norwegian accommodations in the heart of Bergen, the beautiful town that inspired Arendelle, the setting of Disney's Frozen. With 131 charming guestrooms and several banquet rooms, Grand Terminus is a popular venue for weddings and events. Learn more about the History of Grand Terminus .